Little, Brown Spark, 9780316414319, 304pp. Neuroscientists suggest that the biological lifespan of a feeling, often known first through bodily sensations, lasts approximately 90 seconds. Dr. Rosenberg teaches readers to be aware, consciously lean into, and balance these unpleasant emotions by riding one or more 90-second waves of the bodily sensations. By staying present to these 8 feelings, we cultivate the confidence that we can handle life's challenges and the deep sense we can pursue whatever we want. 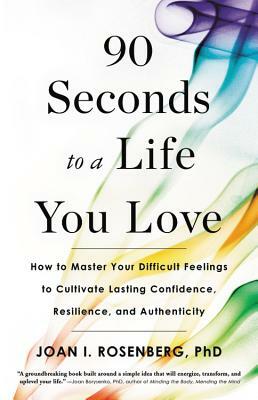 Combining more than three decades of clinical experience with aspects of clinical psychology, mindfulness, and neuroscience research, 90 Seconds to a Life You Love is a strategic and practical guide on building core emotional strength, reducing anxiety, and developing the confidence you need to create a life of your design -- a life you love. Joan Rosenberg, PhD, is a cutting-edge psychologist who is known as an innovative thinker, speaker and trainer. A two-time TEDx speaker and member of the Association of Transformational Leaders, she has been recognized for her thought leadership in personal development. She is a professor at Pepperdine University and a United States Air Force veteran. She has been featured in the critically acclaimed documentaries I Am with Tom Shadyac, The Miracle Mindset with JJ Virgin, Pursuing Happiness with Adam Shell, and The Hidden Epidemic with Daniel Amen. She's been seen on CNN's American Morning, the OWN network, and featured on radio programs across the country.